Seven years ago, we began an annual scholarship fund to remember my sister, Tracie Joy McBride, who died tragically in 1995 at the age of 19. This year marks the year that Tracie has been gone 23 years , so the goal of our campaign is to show the exponential impact her life had despite its shortened time frame. 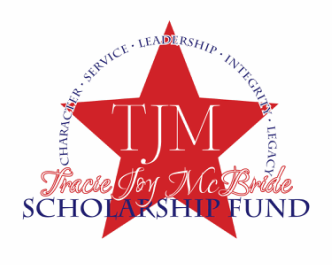 We would love your help to keep Tracie's memory alive by supporting our 11th Annual Tracie Joy McBride Scholarship Fund Campaign and learning more about our mission through our Facebook page (search Tracie Joy McBride Scholarship Fund), and our website. The funds raised are used to bless those who have sacrificed their life and their families in service to our country. Watch our Facebook page for upcoming projects. As for 2019, we still wish to provide our annual scholarships; thus, we need your continued support through generous donations and participation in other TJM events. 2. Visit us on March 29th to shop the silent auction. Also watch for options of an online auction. 1. We need volunteers in the kitchen on March 3rd. Two shifts-lunch & dinner. c. Items to be included in baskets that we will build with other donations. 3. Food Donations for the event (Any of the food that is donated will help bring down our event costs thus increasing the amount we can donate from the event fees, over and above the guaranteed $15/participant). b. Items for gift bags-if you work for someplace that donates items for gift bags (approx. 50 of each item. Many thanks for your consideration of supporting the Tracie Joy McBride Scholarship Fund! 1. Donate a silent auction item. * Silent auction donations can be sent to tjmscholarshipfund@comcast.net. Please include donor/business name, item description, value, and a photograph if possible. They can be dropped off at the church in March or make arrangements for pick up with one of us. * We will be posting the silent auction items on our Facebook page. Check our page frequently for updated items. * We have been blessed by generous cash contributors for the past several years. Join us for a full day of working on some of your favorite crafting projects!. Whether your crafting passion is scrapbooking, card-making, stamping, quilting, jewelry making, or something else, bring it along and we will provide the table space, 2 meals (on Saturday only) to build up your energy... reserves, and company to make it a fun-filled productive day! The day will also include our TJM Silent Auction and the Scrap and Craft Thrift Sale. Feel free to bring along a basket to donate to the silent auction or unwanted crafting supplies to contribute to the free-will donation thrift sale. All proceeds from the Auction and Thrift Sale, as well as $15 from each registration fee, support the TJM Scholarship Fund. This year our fundraising efforts will support military families and veterans as we prepare care packages for homeless veterans, provide gifts for children with deployed military parents, award scholarships for military members, and other military-related outreach efforts. Additionally, 10% of our funds will continue to support a mission team aiming to share the great news of Christ's love. Funds support our military members and missions! Follow us on Facebook for all updates.